A young woman named Rosa (Alessandra de Rossi) leaves her family in the Philippines to take a job as a maid for a family in Singapore. Mr. and Mrs. Teo, her new employers, greet her warmly and explain to her that she has arrived during "Hungry Ghost Month". According to superstition, this is the month that the gates of hell are opened, allowing the dead to walk among the living. The Teo's leave offerings for the dead, and warn their new maid to be aware during the month, the ghosts are all around and need to be respected. Being a foreigner in a new culture, it is not long before Rosa has done something to upset the ghosts. She is menaced by frightening apparitions, and begins to suspect that her seemingly benevolent hosts may be hiding something. 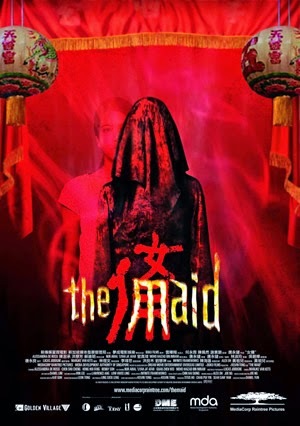 THE MAID was touted as “Singapore’s first horror movie,” and was a huge hit in that country. It certainly is a good movie from a technical point-of-view. It’s a great looking production, with several eerie moments and some well-executed jolts. Unfortunately, the movie feels like one we’ve seen many times before. THE MAID is content to emulate the many Asian horror outings that came before it. It lacks any unique quality to set it apart from its peers. That’s too bad, because the film has the potential to be so much more. Labels: Foreign, Horror Posted by Erik S.